He has worked as a composer for cinema, television and theatre, also writing didactic articles for specialized magazines as Chitarre and Axe. He has published for Sinfonica Jazz the manuals Manuale di chitarra moderna and Suonare la Teoria – voll.1 & 2, Corso Completo di Chitarra Acustica, Lezioni di chitarra Acustica e Classica Fingerstyle Vol. 1, and for Fingerpicking.net the books of original compositions for acoustic guitar Original Composition and Freestyle. Clive Carroll was raised in a family with deep bluegrass and Irish musical roots. It’s the encounter with John Renbourn in 1998 that spurred this precocious and brilliant acoustic guitarist to publish his first solo album, “Sixth Sense”, defined by British critics as a milestone in the journey of acoustic guitar. From that moment his career has been a constant ascent in the international guitar world; he is today one of the most sought-after guitar performers in the world and his fame is destined to keep growing, as predicted by artists such as Tommy Emmanuel and John Renbourn, who shared with him several tours and festivals. The musical variety of his compositions is remarkable, combined with immaculate, complete and stylistically varied technique, expressed with amazing effortlessness. 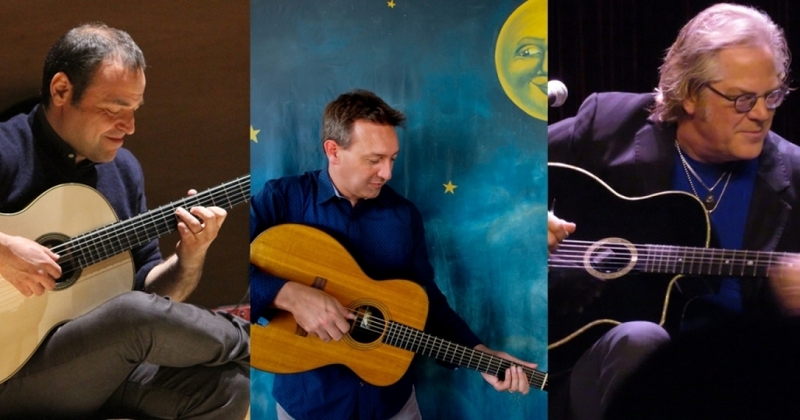 Grammy-winning guitarist John Jorgenson is known as the “US Ambassador of Gypsy Jazz” and is internationally acclaimed as a virtuoso guitarist as well as a multi-instrumentalist who has played for artists as diverse as Luciano Pavarottiand Bob Dylan. Over the course of his 40 year career he has been a founding member of the multiple chart topping country group the Desert Rose Band, award winning guitar trio the Hellecasters, toured for 6 years with Elton John, and performed on television and recordings with Roy Orbison, Bonnie Raitt, Bob Seeger, Johnny Cash, Tom Petty, Earl Scruggs and countless other world class artists.